The UFC returned to Houston, Texas, on Saturday night—on the eve of the Super Bowl—for a night of fights at the Toyota Center. We were treated to a twelve-fight card, including six bouts appearing on the main card broadcast on Fox Sports 1. 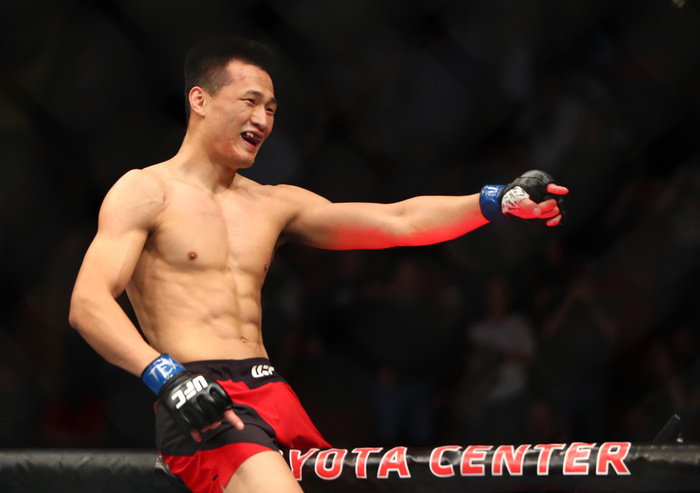 The event headliner saw the return of “The Korean Zombie” Chang Sung Jung, fresh off his mandatory military service in his native South Korea, taking on the gritty Dennis Bermudez in a fight guaranteed to provide fireworks. Miss the fights? Don’t worry—we’ve got you covered. 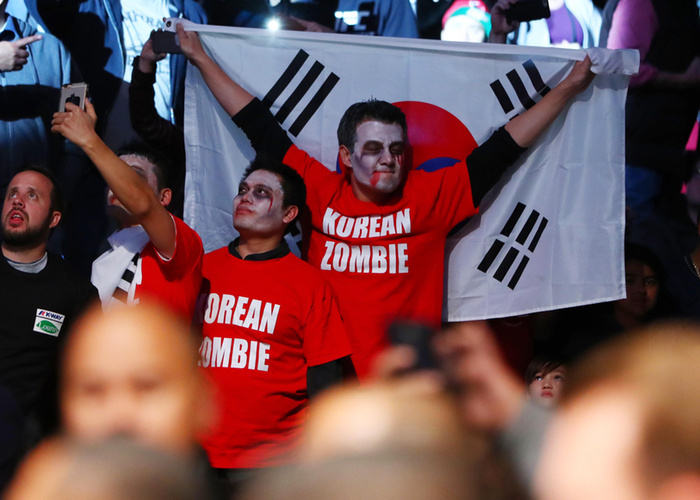 It had been over three years since we last saw “The Korean Zombie” Chan Sung Jung, compete in the Octagon. Now referred to as “Zombie” on UFC graphics and by the commentary team of Jon Anik and Brian Stann, Jung had a stiff test on his return after such a long layoff against Dennis Bermudez. That could have played a factor in the early stages as Bermudez landed a couple of big shots to the dome of Zombie, who wore them in typical fashion. Bermudez did well to keep Zombie guessing, faking the takedown to come over the top with an overhand right, then opting to shoot for the takedown in chain sequences with constant movement. However, Zombie did well to stuff any takedown attempts from the American despite the obvious ring rust he’d be experiencing. In another crazed flurry, Bermudez—who often fights low with his head down and centre—threw a left jab which was handily slipped by Zombie to be met by perfectly-timed right uppercut to send Bermudez crumpled on the Octagon canvas. You can’t help but feel we’ve missed over three years of the Korean’s fighting prime with his extended hiatus. But, it was a fantastic reminder why we all missed Zombie from competing in the Octagon and a perfect way for him to get over his defeat against Jose Aldo which loomed over him since the summer of 2013. Backed by a sizeable contingent of Mexican-American fans in the crowd, Alexa Grasso was hoping to live up to the big billing given to her as the main attraction in this event’s co-headliner against Felice Herrig. It was an odd decision, given this fight pitted #12 ranked strawweight Grasso against the unranked Herrig—and it was a decision which didn’t pay off in the interests of the UFC. Grasso simply never got going in the fight, struggling to ever properly gauge her distance properly and Herrig took full advantage. Grasso’s kicks continually came up short of her opponent, with Herrig responding in kind with straight rights, looping overhand punches and a couple of easily-scored takedowns mixed in. Grasso ended the fight well, landing a flurry of punches to punctuate a third round with little action. But, it wasn’t enough. Herrig comfortably won the decision 30-27, 29-28 and 29-28 much to the shock of Grasso. The latter’s reaction was as surprising as her fairly lacklustre performance. A Texas native was victorious in Houston, as tall, rangy lightweight James Vick successfully rebounded from the first loss of his career and snapped the four-fight win streak of Abel Trujillo in the process. The boo-happy Houston crowd wasn’t particularly enamoured with the first round, but Vick did well to keep the wrestling of Trujillo at bay with neat boxing and an ever-present jab. The second stanza followed the pace of the first, though much of the round was contested on the mat with Vick looking to have secured a tight D’Arce choke. Trujillo proved his toughness to avoid tapping until the horn signalled the end to the round. Unlike the two preceding it, the third round started off with a bang. Vick split Trujillo’s guard with a stunning flying knee which sent the latter reeling. In amongst the mayhem, Trujillo landed some desperate, wild hooks before scoring a panic-led takedown as Vick’s body was twisted from a body kick he threw. However, Trujilo once again landed himself in a D’Arce choke as Vick’s long limbs wrapped around his neck. There was no getting out of this one as Trujillo taps to the delight of Vick and those in attendance. Little-known commodity Volkan Oezdemir, the first Swiss fighter to compete in the Octagon, looked to have a tough debut test ahead of him as he took on #6 ranked light heavyweight Ovince Saint Preux as a late opponent on just two weeks’ notice. For a debutant, Oezdemir looked both comfortable and confident as he landed a number of punches, kicks and combinations on “OSP,” who was in constant retreat. However, as the second round came about, Oezdemir had visibly tired and it was now OSP who was pressing the action—though that level of output was heavily booed by a restless Houston crowd as the action slowed considerably. The third round continued in a similar vein to that of the second stanza—both men slowed down considerably, with OSP landing the better shots as the fight came to a close. However, two of the judges saw the fight differently to most with Oezdemir getting the nod (29-28, 29-28, 28-29) from two of three judges in a controversial split decision which was widely derided by those in attendance. Though it was an unsatisfactory end to the contest, Oezdemir did handle the challenge of OSP comfortably and could be a name to watch in a lagging light heavyweight division in the near future—if he can improve his cardio, anyway. A natural light heavyweight, UFC debutant Marcel Fortuna weighed in at 210lbs to take on hulking heavyweight Anthony Hamilton, who weighed in at 258.5lbs, on Saturday night. On paper, it looked like the odds were stacked against Fortuna. That also looked the case in the fight itself. Fortuna picked up a nasty cut above his right eye following an accidental clash of heads—a cut bad enough to prompt referee Herb Dean to pause the fight to allow the doctor to assess the damage. Luckily for Fortuna, the fight was allowed to continue. Hamilton recklessly charged into Fortuna with a looping right hand and Fortuna weaved out the way to land a check right hook of his own to send Hamilton faceplanting down on the canvas. Sensing his opponent was done, Fortuna coolly walked off in celebration. Not a bad start to life in the UFC. What a fight. As great as this recap is, you will have to watch this strawweight scrap for yourself to truly appreciate the pace set by both women. Both women have recently reinvigorated their careers—Angela Hill earned a four-fight winning run and the Invicta 115lbs belt after being cut from the UFC, while Andrade seems a prospect primed for a shot at Joanna Jedrzejczyk’s UFC title after dropping down to strawweight following a reasonably successful spell as a bantamweight. All three rounds of this fight followed a familiar theme—Andrade fearlessly pushed the pace and was accurate in both body and head work, while Hill landed nice, technical kickboxing counters to maintain the respect of her aggressive counterpart. Hill ate some big punches in all three rounds with her toughness more than making up her severe lack of striking defence. After three action-packed rounds, Andrade was rightly awarded a unanimous decision with all three judges scoring the fight 30-27. Andrade answered any questions of her cardio, looking fresh after three rounds of impressive output, and is surely the next in line to take on Jedrzejczyk. This wasn’t the most competitive of fights. Curtis Blaydes made his intentions clear from the outset—shooting in for a takedown within 10 seconds and sending Adam Milstead crashing down to the mat with consummate ease. Milstead would then work his way up to his feet, before being suplexed to the mat once again. Rinse and repeat with the action resembling Brock Lesnar continually suplexing “opponents” in a WWE ring. However, Milstead was in visible discomfort—grimacing under the pressure of Blaydes which instantly suggested something was amiss. This proved to be the case as his right knee collapsed from underneath him in the second round, prompting Milstead to clutch his leg and holler in pain. The fight was instantly called off, with Blaydes awarded the unfortunate TKO win with 59 seconds elapsed in the second round. It seems a tad careless from Milstead’s corner to send their man out for a second round with a knee which was clearly not in fighting shape. Texas boy Chas Skelly wowed the Houston crowd in a commanding performance over veteran Chris Gruetzemacher, who was making his first UFC appearance since his victory at the finale of his season of The Ultimate Fighter back in 2015. Riding a 12-fight win streak, Greutzemacher struggled to deal with the striking of Skelly, as well as the wrestling abilities of a man who earned NAIA All-American honours during his time at Oklahoma City University. It’s that wrestling skill which eventually told—after scoring another driving double leg takedown, Skelly managed to move to Gruetzemacher’s back and easily secure a rear-naked choke to snap his opponent’s winning run with just two minutes elapsed in the second round. Skelly has quietly put together an impressive run in the UFC, with a promotion record which now moves to 6-2. Ricardo Ramos certainly made an impression on his UFC debut. The Brazilian bantamweight took on Japan’s five-fight UFC veteran Michinori Tanaka and came close to finishing him twice, before the judges’ verdict went in his favour. The debutant almost finished Tanaka by strikes after landing a big counter right hand—sending his Japanese foe crashing to the canvas in the first round. Ramos’ resultant ground and pound looked to be enough to finish the fight, but Tanaka did well to survive the assault. In the second round, Ramos showed off the many wrinkles of his ground game, controlling the fight on the ground and almost securing an armbar. The third round saw a tired Tanaka warned for timidity by referee Herb Dean, but he did end the fight well with a takedown followed up by some accurate strikes on the ground. But, it wasn’t enough—the judges awarded the fight to Ramos 30-27, 29-28 and 29-28. No matter what Bec Rawlings tried, Tecia Torres had an answer for it. It hadn’t been a good 48 hours for Bec Rawlings, who forced the fight to be competed at a catchweight at 117.5lbs after she missed weight. Rawlings was ponderous, plodding and unable to come up with any suitable alternative for Torres, with the gulf in talent between both women clear to see. Torres comfortably had the better of all striking and grappling exchanges throughout the fight, though Rawlings did well to never find herself in any true danger. The judges agreed, awarding Torres a clean sweep unanimous decision with scores of 30-27 in her favour. Fresh off his upset win over Brandon Thatch at UFC 207, Niko Price quickly returned to the Octagon for his sophomore appearance to take on hometown boy Alex Morono as a last-minute opponent. In an action-packed first round, both men traded plenty of big strikes. However, Morono’s power soon told as Price was staggered by a clubbing left hook to send him stumbling backwards in retreat. Price did well to recover, but as the pair reset, Morono landed a spinning backfist followed with a right hook to send Price crashing down to the canvas with just seconds remaining in the round. It’s safe to say Price was saved by the bell. Sporting visible damage from the minutes previous, Price looked fresh considering he had the piss beaten out of him in the first and started the second round as if nothing had happened in the first. Morono was having the better of the striking exchanges once again, but begun to visibly tire with his technique leaving him as he threw wild arm punches. Price started to push the pace as the second round came to a close like his opponent did to him the round previous. Ducking under a flurry of sloppy punches, Price countered with a big right hook which slumps Morono as the horn sounds. Beautiful buzzer beater finish to a fight which perfectly encapsulates the unpredictability of MMA. Both men were seeking their first wins inside the Octagon on Saturday night—someone’s “0 must go” in reverse. Rountree appeared the aggressor early, but action was rather lacking in the opening 30 seconds as both light heavyweights sized each other up. Jolly soon dove for a double leg which was handily stuffed by Rountree. As Jolly returned to his feet and move the fight against the fence, Rountree delivers a crushing knee to the head of his opponent before driving another in the same spot to force referee Chris Reed to intervene. Spectacular finish and Rountree will hope this victory kickstarts his UFC career.